The season is finally under way and WOW I am happy it is. After many months of hard work through the winter, it is often the case that getting the first race in the bank successfully provides such a relief and sense of satisfaction. I have been based down in Noosa, Australia since March 8th. 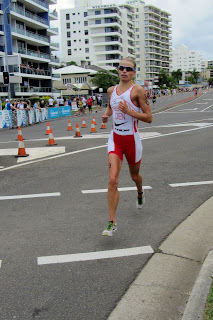 I have 3 races scheduled within this block of travel, with Mooloolaba ITU World Cup, this past weekend being the first. 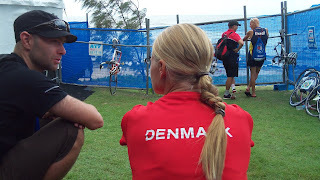 Mooloolaba is always a tough race but high winds, rough water conditions combined with the strongest start list ever assembled for an ITU World Cup event meant there was to be no hiding out there. Rough seas meant the swim was a very physical battle, never before have I experienced screams 400m into a swim race. Well I did here, I imagine (hope) they were screams of frustration, never the less girls were screaming around the first buoy. It was pure hell, know one wanted to give up their line, so as you can imagine 50+, adrenaline filled, girls all caught around one turning buoy makes for a messy scenario. It is definitely not for the faint hearted. Safely managing to get around the first buoy it was then all about keeping my focus. I swam as OK and kept my head on the task, not worrying too much about what was happening around me. I exited the water approximately mid pack. Immediately committing to working hard and closing any gaps ahead of me. Working well with fellow scandinavian Lisa Norden (Sweden), at the first part of the bike, we managed to work our way up to form a main chase pack of around 20 girls. This chase pack was unfortunately not committed to catching the leaders. So for the entire 40 km a group of 9 girls (Spirig, Ryf, Moffatt, Bennett, Densham, Oliveira, Hewitt, Klamer, Blatchford) worked well out in front to establish a 1 minute 20 lead on our chase group by the time we were entering T2. Safely through T2 it was now a case of running hard and securing some solid Olympic points. 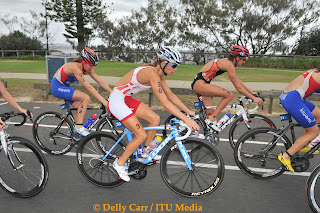 (Olympic points are awarded to the top 50 girls in ITU World Cup and ITU World Triathlon Series events, providing you finish within 6% of the winners time. All adding towards Olympic selection) If I am truly honest I did not have super running legs on the day. With Mooloolaba being one of the toughest run courses on the ITU circuit, I was certainly going to have to suffer to hold my own out there. Suffer I did. The run was tough and as it progressed it did not get easier, however I was able to hold it together. Securing a very solid 16th place finish. It was a satisfying start to the year. Having now had time to reflect on the race, there are many positives that will be taken away from the result. There are many tweaks to be made. Like most of the girls at this time of year, I am a little way from 100% race sharp, this was to be expected. Hopefully now as the season progresses this sharpness will come race by race and the results will get better and better. I will now continue to be based in Noosa, Australia with my partner Ben, coach Joel Filliol and the rest of the crew (Kyle Jones, Kerry Lang and Lauren Campbell). Putting in some solid work up until Sydney ITU World Series race on 14th April before flying directly to Eilat, Israel where I will compete in the ITU European Championships 6 days later. Thanks for all your continued support. A special thanks to all of the support on Sunday at Mooloolaba, there were so many of you shouting words of support which really made a massive difference to the suffering out there. For regular more updates visit my website, Facebook and Twitter pages. Also my new YouTube channel.